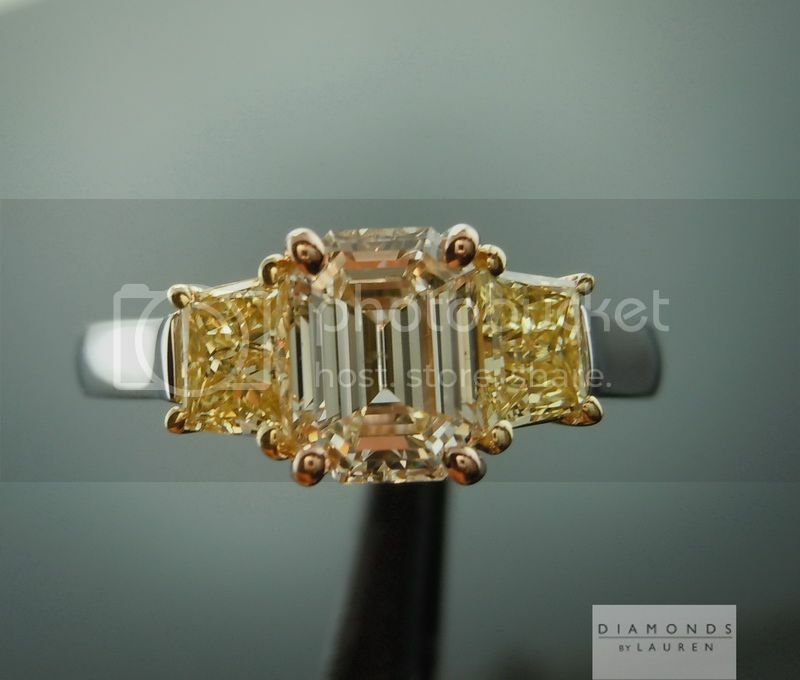 The ring starts with a beautiful Emerald Cut diamond. I really love the cut corners on this stone. They are nice and bold giving the stone a very lovely shape. The cut on this stone is beautiful too. It is very easy to get lost in the "hall of mirrors" of this stone as it moves. The stone being K in color has a very slight warmth to it. However I personally do not see this as a negative at all. In fact I think this adds to the over all beauty of the stone. 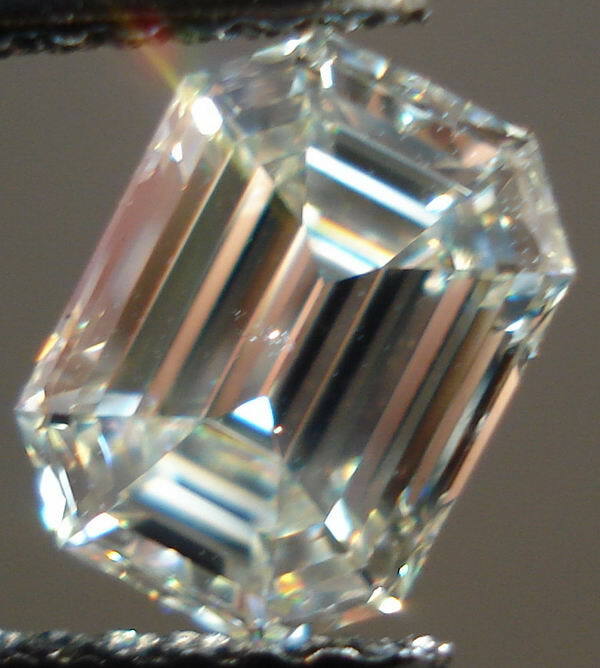 The clarity on this stone is SI2. And while the inclusions seem rather obvious in the pictures and video, it is really hard to find them in person with the naked eye. Holy carp did we get lucky on this one! This ring started life as item R2727. 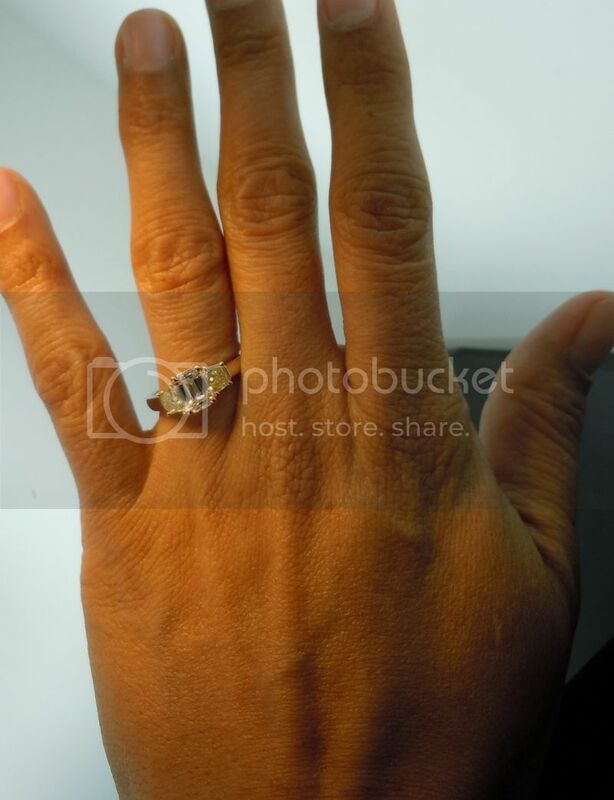 The center stone in that ring is worth more than $40,000. 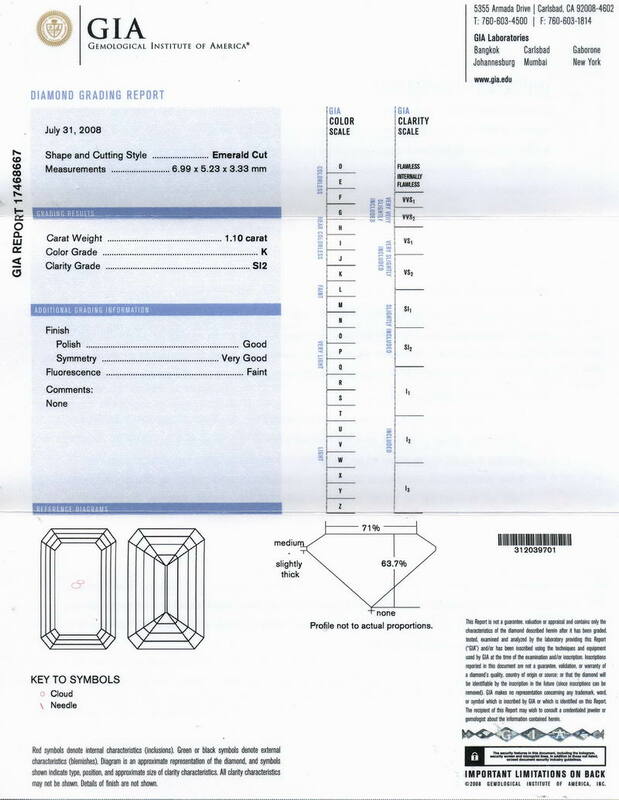 Still, as one carat pink diamond go, it's moderately priced. So I started to scratch my head after seeing it in our stock for four years. Why did it not sell? One of the most difficult things as an artist is critiquing your own work. In many ways, these inspiration for the design of our rings spring from the same internal pool that would lead me to write a song or a poem. But in every case, it's difficult to look at your own work objectively. 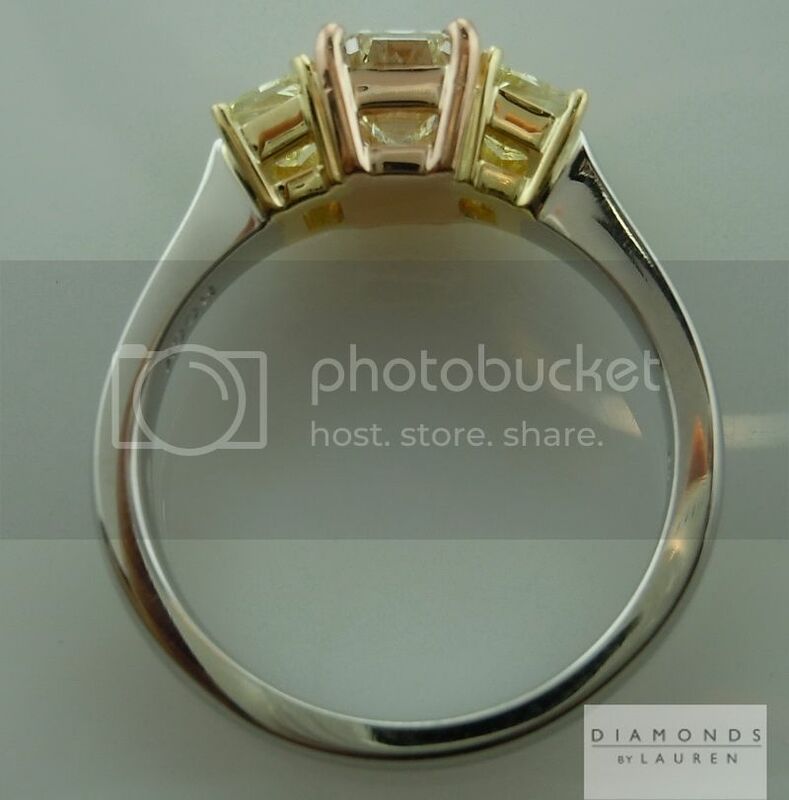 The other day I looked at this ring and it hit me like a brick in the head – THIS pink diamond does not look good next to THESE intense yellow diamonds! 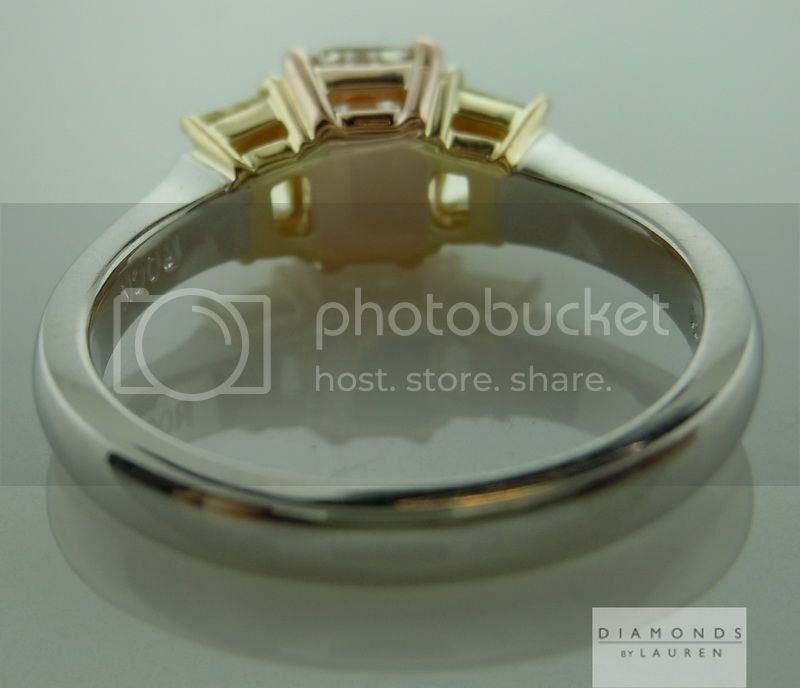 So I took out my prong puller, and I yanked the center stone out of the ring. Okay, "yank" is too strong a word here. 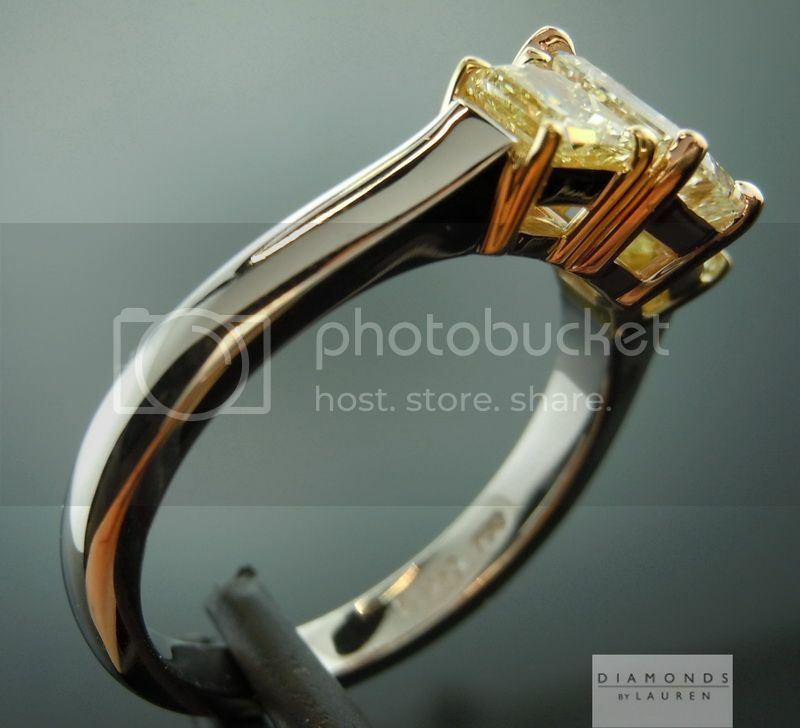 I ever so carefully removed the center stone – doing as little damage as possible to the prongs. 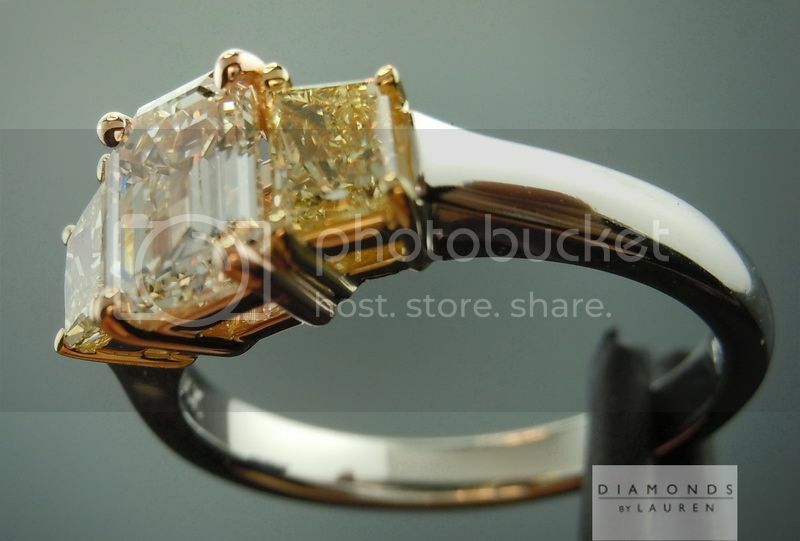 The fancy light orangey pink diamond is getting a new ring that I believe will highlight its pink color much better. But that's another story for another listing. 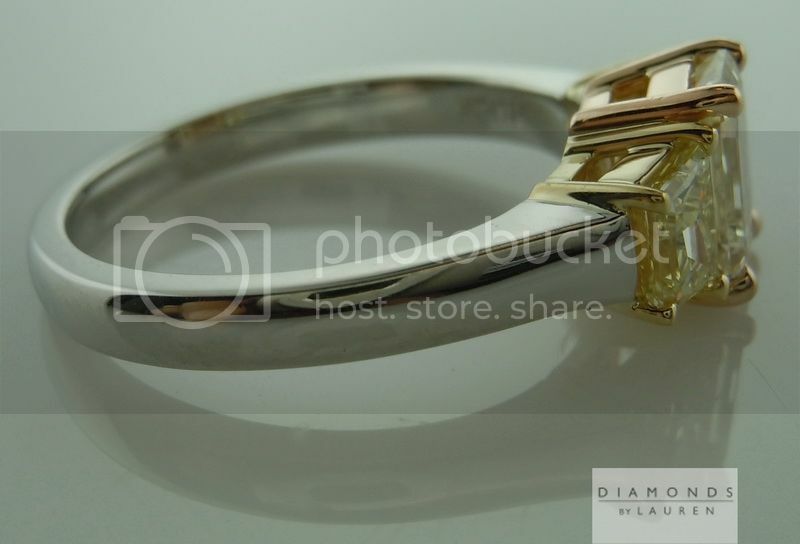 Yes that's right, we now have this beautiful ring with a pink gold center portion, and a pair of fancy intense yellow trapezoidal side diamonds – just waiting for another diamond to be set into it. We tried quite a few different diamonds – of all different colors. This stone immediately stood out because it seemed to fit perfectly in terms of size. 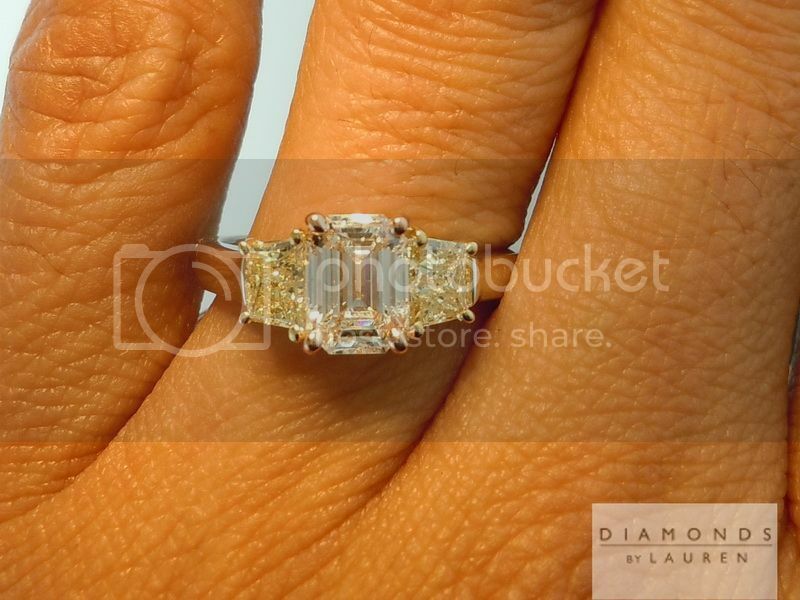 Mind you, you can't really get the full effect of how a diamonds going to look once it's properly set just by sitting in on the prongs, as we were doing. I had no idea that the diamond would look as it does now at that moment. When I saw the result, I practically fell off my chair. I don't want to say the center diamond looks like a blazing pink diamond – but you just noticed this… slight pinkness to it. 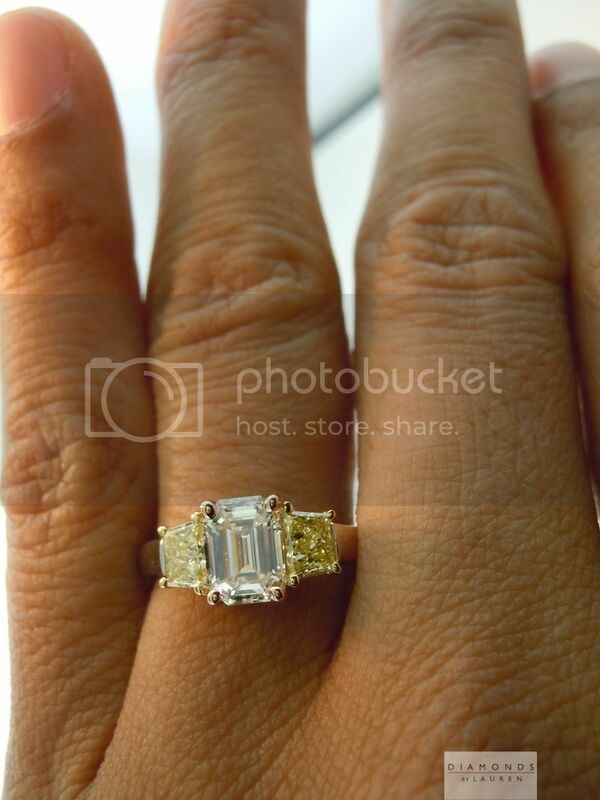 And I don't think this would've happened with one of the E colored diamonds that we tried in the middle. 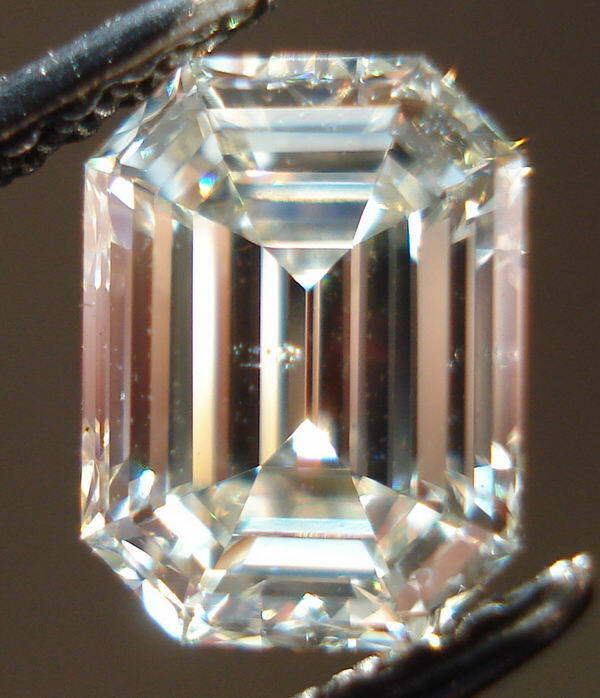 It is my experience that a K color is somehow more suggestible than higher colored diamonds. The photos give you the idea. 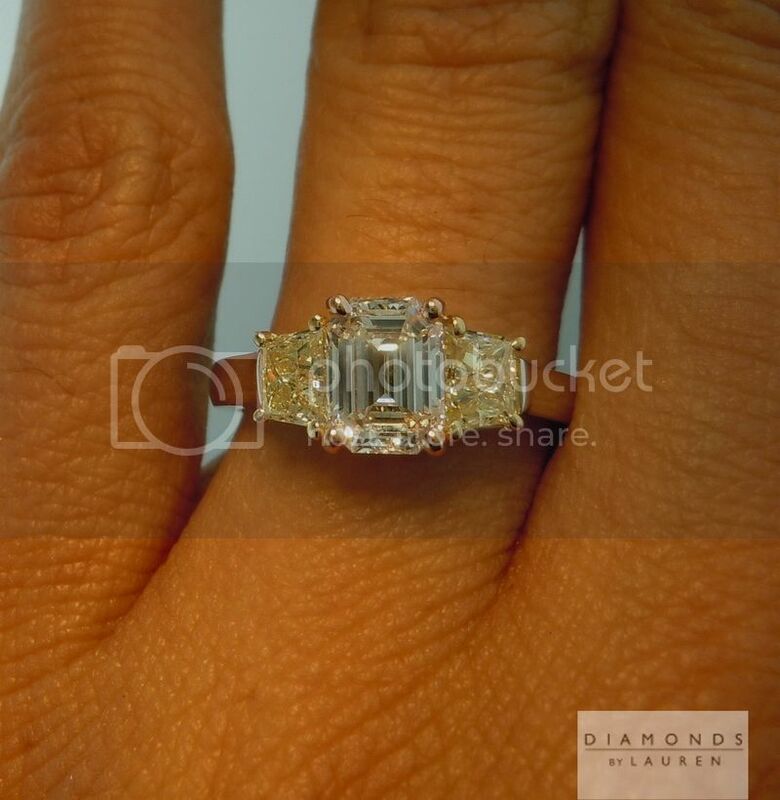 Ironic that the yellow diamonds somehow lessened the pinkness impact of the radiant cut diamond – yet with this stone, I'm quite sure they're adding to it. 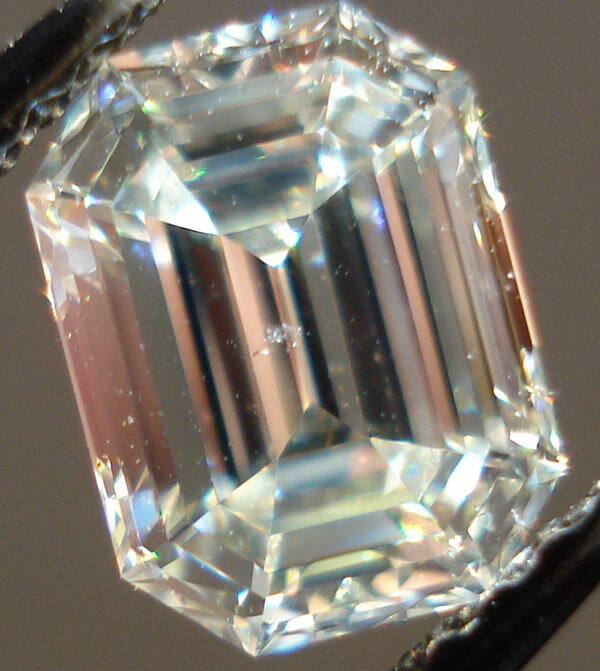 In addition, my natural inclination is not to put brilliant faceted diamonds on the side of a step cut center. 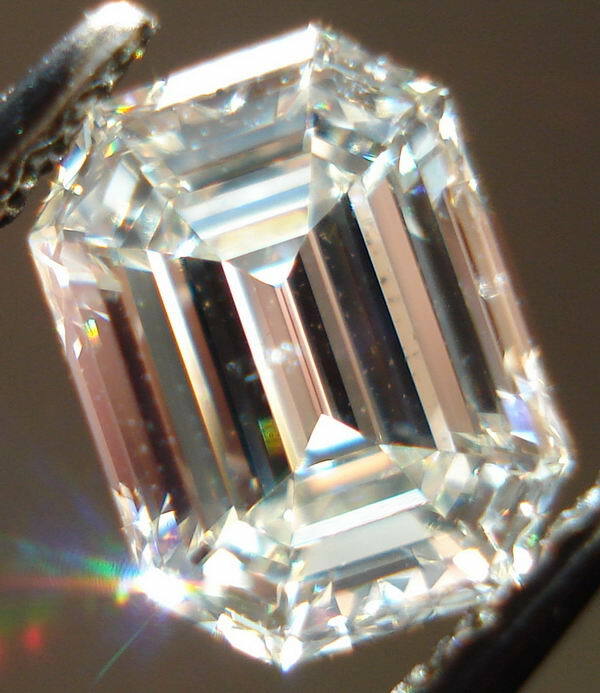 If the trapezoidal brilliant side diamonds were K color to match the center, I feel quite sure I would not like this ring as much from the perspective of light performance of each of the diamonds. In this case, the side diamonds contrast beautifully to the color of the center and totally emphasize the steps of the beautifully step cut center diamond. 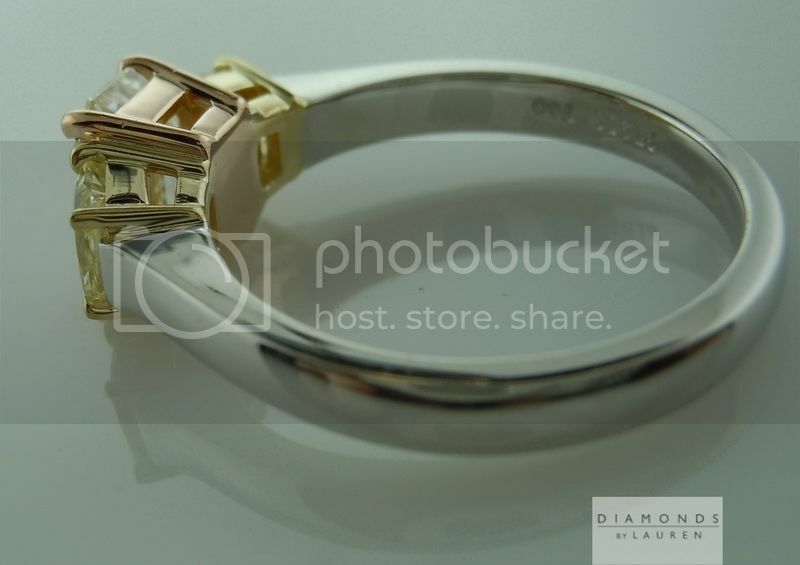 And, it fits perfectly – the side diamonds are the exact perfect size for the center, in my opinion.